3 For the time will come when they will not endure sound doctrine; but after their own lusts shall they heap to themselves teachers, having itching ears;"
We are witnesses to the times we are living in, the end times. How do we know? The bible warned about these times, Matthew 24 details the signs of these times. Before we go on, I think we should review these signs. I taught international politics for 20 years before I entered the ministry full time, so this is an area that is particularly fascinating to me. The Bible prophesies a very specific end time configuration of world politics. Israel is pictured as being re-established (Ezekiel 37:21-22) and surrounded by hostile Arab neighbors intent on its destruction (Ezekiel 35:1 – 36:7). This, of course has been the situation in the Middle East since the Israeli Declaration of Independence in May of 1948. Daniel prophesied that the Roman Empire would be revived (Daniel 2:36-41), something many men — like Charlemagne, Napoleon, and Hitler — tried to do through force. But the prophecy had to await God’s timing for its fulfillment, and that came after World War II, with the formation of the European Common Market that has since morphed into the superpower called the European Union. The Bible pictures a great power located in the land of Magog in the “remote parts of the north.” This nation will menace Israel in the end times and will ultimately lead an invasion of Israel together with specified allies, all of which are modern day Muslim states (Ezekiel 38:1 – 39:16). Russia with all its Muslim republics and its Muslim allies fits this description precisely. The development of nuclear weapons seems to be foreshadowed by this prophecy in Luke 21 that speaks of people “fainting from fear” due to the “powers of the heavens being shaken.” The incredible carnage of the Seal and Trumpet Judgments portrayed in chapters 6 and 8 in the book of Revelation indicates that the Antichrist will conquer the world through the use of nuclear weapons. We are told that one-third of the earth will be burned and that one-half of humanity will be killed. Further evidence that this is a nuclear holocaust is found in Revelation 16 where we are told that at the end of the Tribulation the survivors will be covered with sores that will not heal (Revelation 16:11). As I pointed out earlier, there are many end time prophecies that simply cannot be understood apart from modern technological developments. Consider the prophecy in Revelation 11 about the two witnesses who will call the world to repentance during the first half of the Tribulation. When they are killed by the Antichrist, we are told that their bodies will lie in the streets of Jerusalem for three and a half days, and the whole world will look upon them (Revelation 11:9). How could anyone understand such a prophecy before the development of satellite television in the 1960’s? Likewise, how could the Antichrist control all buying and selling worldwide (Revelation 13) without the aid of computer technology? How could the False Prophet create the illusion of giving life to a statue (Revelation 13) without the technology of holograms, virtual reality, and robotics? How could an army of 200 million come out of the Far East (Revelation 9) before the population explosion that was produced by modern medical technology? How could the Gospel be proclaimed to all the world (Matthew 24) before the invention of motion pictures, radio, television, and the Internet? The list goes on and on. The signs that relate to Israel are the most important of all because the Jews are God’s prophetic time clock. What I mean by this is that the Scriptures will often tie a prophesied future event with something that will happen to the Jews. We are told to watch the Jews, and when the prophesied event concerning them occurs, we can be sure that the other prophesied event will also occur. An example can be found in Luke 21:24 where Jesus prophesied that the Jews would be dispersed from Jerusalem and be led captive among the nations. But then He added that one day they would return to re-occupy Jerusalem, and when this happens, the end time events will occur that will lead to His return. There are many prophecies concerning the Jews in the end times, many of which began to be fulfilled in the 20th Century, but there are four key ones. The first is their worldwide regathering in unbelief (Isaiah 11:11-12). In 1900 there were only 40,000 Jews in Palestine. By the end of World War II that number had risen to 800,000. Today, there are more than 5.7 million who have come from all over the world. Very soon there will be as many Jews in Israel as died in the Holocaust. The prophet Jeremiah says twice that when history is completed, the Jewish people will look back and conclude that their worldwide regathering was a greater miracle than their deliverance from Egyptian captivity (Jeremiah 16:14-15 and 23:7-8). We are truly living in momentous times! The second key prophecy concerning the Jews is a natural consequence of their regathering. It is the re-establishment of their state which occurred on May 14, 1948 (Isaiah 66:7-8). The third key prophecy is the re-occupation of Jerusalem which occurred on June 7, 1967 during the miraculous Six Day War (Zechariah 8:4-8). The fourth key prophecy is the one whose fulfillment we are witnessing today — the re-focusing of world politics upon the nation of Israel (Zechariah 12:2-3). All the nations of the world, including the United States, are coming against Israel over the issue of the control of the nation’s capital — the city of Jerusalem. The Vatican wants the city put under its control. The United Nations wants it to be internationalized. The European Union is demanding it be divided between the Arabs and the Jews. The Arabs want all of it. Scripture is always clear and to the point. These biblically prophetic signs were foretold in ancient biblical history. Not only can the fulfillment of these warnings be clearly witnessed today, but their fulfillment provides absolute proof that the Bible is true and can be trusted. How could anyone miss it? How can anyone not believe God's word when we are seeing these things play out before our eyes? How can anyone not heed these warnings? As I mentioned before, we are witnesses to the times we are living in. These are exciting times, indeed! And yet we still have the sense of sadness, concern, and urgency. Our hearts are burdened with sadness over the state of the church; concern for our loved ones; and urgency to share the gospel with a world held tight in the grip of Satan's hand. Satan has waged his war against God from the beginning. God's Word has been the target all along. Hath God said??? Satan who is a liar, is also a thief, and a killer and will stop at nothing in an attempt to destroy God's kingdom. His battle plan is decisive, and there is never a cease fire on his attacks against the Truth of Scripture, and the Church. His plan is to destroy it from within, and from without, through deception and lies, through vain philosophies and every wind of doctrine, and through the culture around us entrenched in wickedness. We don't fear who will win the battle, for Christ has already won! He has risen victorious over sin and death...He is returning for His bride, the Church...He is coming again as King of kings and LORD of lords...Every knee will bow before him...Every tongue will confess that Jesus is Lord...Satan and his minions will be destroyed...The wicked will be judged...There will be a new heaven and a new earth....and we will live forever , together with the Lord! Until that time comes we remain sober-minded and vigilant because we know our adversary the devil is seeking to devour us. The days are short, the time is at hand and many lives are at great risk of eternal damnation. You see there are those who are susceptible in this battle, those whose hearts and minds are not fully yielded to the Lord and grounded in God's Word. Those who have yet to hear the gospel and the opportunity to come to Christ. The scriptures warn of those who will fall away. I pray it won't be you! For many who once claimed to be believer's are falling away, denouncing their faith and living for the sin and pleasures of this world. Some have embraced the vain philosophies of men and have cast aside the truth of scripture. Some are falling prey to doctrines of demons and their false religious systems. Some have fallen prey to wolves in sheep's clothing, causing them to walk away from the faith. They have become discouraged and weakened, they have lost confidence in Bible and faith in their God. Why? Why? Because they have never developed in a living relationship with the Lord. They have not grounded themselves in His word. They have not applied the word of God to their lives, walked in obedience, grown in maturity....they are those who live according to flesh and not the Spirit. When Paul says, “Now the Spirit speaketh expressly, that in the latter times some shall depart from the faith, giving heed to seducing spirits, and doctrines of devils” he is warning the Church against false teachers. Moses warned about false prophets trying to lead people away from God in Deuteronomy 13:12-18. Jesus warned about false prophets in the Sermon on the Mount (Matt 7:15-16), and many other New Testament passages warn about it as well. Why aren't believer's giving heed to scripture's warning? In the book of Jeremiah chapter 25, we can see that the prophet Jeremiah is once again speaking to the people of Judah. Jeremiah along with other prophets had been tasked with telling the nation of Judah to repent and turn from their sinful ways. As the scripture says in verse 4, the prophets who were assigned to relay God’s message, did so over and over again. In verses 4-6, Jeremiah tells the people of Judah that they have essentially ignored the many messages that were given by the prophets. However, the consequences of such ignorance is displayed in the next few verses of chapter 25. "Yet ye have not hearkened unto me, saith the Lord; that ye might provoke me to anger with the works of your hands to your own hurt. Therefore thus saith the Lord of hosts; Because ye have not heard my words, Behold, I will send and take all the families of the north, saith the Lord, and Nebuchadrezzar the king of Babylon, my servant, and will bring them against this land, and against the inhabitants thereof, and against all these nations round about, and will utterly destroy them, and make them an astonishment, and an hissing, and perpetual desolations." In the above verses, God’s message to the people of Judah is clear in that, because of their disobedience, their land would be utterly destroyed. The people of Judah had committed many forms of idolatry in addition to living in rebellion. Essentially, the fate that the nation of Judah suffered was that of destruction at the hands of King Nebuchadnezzar’s military which later resulted in the people of Judah being held captive by the Babylonians for 70 years according to verse 11. The point is that, the people of Judah not only ignored the many warnings that God had given, but they eventually experienced negative repercussions as a result of it. Whenever God sends warning, those who do not obey the warning will always suffer from negative consequences. 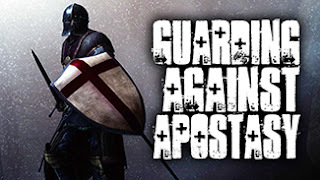 How can we guard our faith and others’ against apostasy? Self-reflection. If you don't do this, perhaps it's time to do some soul searching. David did. In fact, in Psalm 139:23-24, he prays "Search me, O God, and know my heart: try me, and know my thoughts: And see if there be any wicked way in me, and lead me in the way everlasting." Do you have a head knowledge of God, yet no heart knowledge? Do you believe God exists intellectually, but have never truly given your whole heart to the Lord? Have you been born-again of the Spirit? Scripture says, "A double minded man is unstable in all of his ways." James 1:8 Can you serve two masters? "No man can serve two masters: for either he will hate the one, and love the other; or else he will hold to the one, and despise the other, Ye cannot serve God and mammon." Matthew 6:24 Holding back any part of our lives from God is rebellion. The desire to be the master of our lives, rather than allowing him to be LORD of our lives is rebellion. It is because of the rebelliousness and sinful ways of humanity that our world groans. Jesus Christ died on the cross and rose again so that we could be saved from sin and judgment. In addition to this, God has a standard (found in Scripture) of Holy living which is predicated upon our obedience unto Him. When we are obedient to God, we are choosing to reject our sinful nature. This places is in the safety of God’s parameters. When we stray outside of those parameters, we stray right into harms way. Satan does not want those who are in sin to understand that wickedness contributes to being in a place of vulnerability. When you are outside of the will of God, you are opening yourself up to deception and it's consequences. But when your life is submitted to God in obedience, you are no longer vulnerable but you are held in God’s safety. To guard against apostasy, we MUST KNOW THE TRUTH! John 17:17 says, "Sanctify them through thy truth: thy word is truth." We need to study the scriptures from Genesis to Revelation to find the truth. Over and over the bible claims to be the truth. If we want to be able to discern between the truth and a lie, we have to know what the truth is. 2 Timothy 4:3 says, "For the time will come when they will not endure sound doctrine; but after their own lusts shall they heap to themselves teachers, having itching ears." In 2 Timothy 2 is a description of the wrath that will befall on those who have not received the love of the truth that they might be saved. These are troubling times. We see the world becoming more wicked by the hour. We are disturbed by what is going on in the church. How do we deal with it all? How do we keep ourselves from falling? As God's enemies aggressively oppose the Bible’s instructions for living our lives in a way that is pleasing to the Lord....we STAND STRONG on the promises of God! Learn what the Bible teaches! Follow it's instructions! Do what it says! Walk by the Spirit and in truth!!! This is only possible by the Holy Spirit who dwells within every born-again believer. Filling our hearts and minds with the teachings of Scripture is the only place where the Holy Spirit can give us understanding and help us to apply God's wisdom that He has provided for us in His Word! Get acquainted with the scriptures....DAILY! Give heed to them...Prayerfully study them...obey them...and measure all things by God's Holy Word. In conclusion, let's be mindful of the times we are living. Let's not be forgetful hearers of the word, but rather students of the word. Let's be wise concerning our faith. Let's persevere to the end. Let's not be ignorant of the spiritual battle we are engaged in. Let's put on the full armor of God. Let's stand on every promise in His word. Let's keep our hearts and minds cleansed from all unrighteousness. Let our delight be the law of the Lord and let's meditate in it day and night. "Then they that feared the Lord spake often one to another: and the Lord hearkened, and heard it, and a book of remembrance was written before him for them that feared the Lord, and that thought upon his name. And they shall be mine, saith the Lord of hosts, in that day when I make up my jewels; and I will spare them, as a man spareth his own son that serveth him." spake often one to another — Conversed together about spiritual things the more frequently: for though it is not said what was the subject of their conversation with each other, yet we have reason to believe it was as good concerning God and his providence as the discourse of the wicked was evil. They spake what was right concerning God’s justice and mercy, his holiness, forbearance, and long-suffering, his wisdom and equity in his government of the world in general, and of his church and the members of it in particular. And by their pious discourse they endeavoured to arm each other against the impressions which such wicked suggestions as those above mentioned might otherwise have made upon their minds; and to confirm one another in piety and virtue. And the Lord hearkened and heard — Took a special notice of what these pious persons did and said. And a book of remembrance was written — It was as safely laid up in his memory as if it had been entered into a register, in order to be produced at the day of judgment to their praise and honour: see the margin. The words are a beautiful allusion to the records kept by kings, Esther 6:1. And they shall be mine — It shall appear how dear they are to me, when the time comes in which I shall separate the precious from the vile, the vessels of honour from those of dishonour, 2 Timothy 2:20. In the day of the execution of my judgments they shall be distinguished and preserved safe, as choice jewels are wont to be. And I will spare them as a man spareth his own son, — They shall be spared, pitied, and loved, and I will preserve them from those calamities which shall fall upon the wicked and unbelieving, with the same tenderness which a father shows to a dutiful son. The period especially referred to may be the Roman war under Titus. When God should utterly cut off the Jewish Church and nation for their infidelity, the remnant among them, that should be found to believe his word, and having waited for the Messiah, the consolation of Israel, should welcome him when he came; these, being admitted into the Christian Church, should become a peculiar people to God, and God would take care of them, that they should not perish with the unbelievers, but that they should be hid in the day of the Lord’s anger against that nation. These pious ones should have all the glorious privileges of God’s Israel appropriated to them, and centring in them. They should be a peculiar treasure unto him, when the rest were rejected; should be vessels of mercy and honour when the rest should be made vessels of wrath and dishonour. This, however, is very applicable to all the faithful people of God, and the distinction he will put between them and others, in the great day of final accounts.